​A military judge halted a hearing at Guantanamo Bay on Monday when two detainees being tried in connection with the September 11 terror attacks said they recognized their translator from a secret CIA prison where they were formerly held. Moments into the proceedings – the first hearing in six months – Army Col. James L. Pohl recessed court after one defendant, then another, objected to their English-to-Arabic translator, journalists reported from Gitmo. “The problem is I cannot trust him because he was working at the black site with the CIA, and we know him from there,” defendant Ramzi Bin Al-Shibh said soon after Monday morning’s hearing began, according to the Miami Herald. Once Al-Shibh made the allegation, an attorney for co-defendant Walid bin Attash said her client was “visibly shaken” upon seeing the man during Monday’s proceedings and raised the same objection. “My client relayed to me this morning that there is somebody in this courtroom who was participating in his illegal torture,” attorney Cheryl Bormann told Col. Pohl, according to Miami Herald reporter Carol Rosenberg. 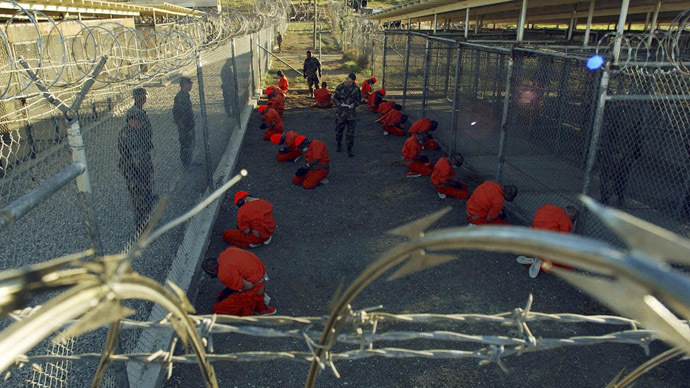 Monday’s hearing was the first for the Gitmo detainees since proceedings took a pause in August, and the first since the Senate Intelligence Committee released an executive summary of its years-in-the-making report on the CIA’s use of torture in the aftermath of the 9/11 attacks. Al-Shibh, 42, and Attash, 36, were captured in 2002 and 2003, respectively, and held by the CIA at a secret prison until being transferred to Gitmo in 2006. Both detainees appear in last year’s Senate report as being victims of harsh interrogation techniques deployed by US investigators in an effort to elicit intelligence from suspected terrorists. According to the Senate’s analysis, US efforts to coerce detainees into providing information to authorities through torture proved to be largely unsuccessful. “I can tell you he was hung from his wrists for days on end, pursuant to page 117,” Bormann said of Attash, when asked by the Guardian about the report last year. When the Senate’s findings were released in December, attorneys for Bin Al-Shibh said their client should be tried separately from the other suspected 9/11 plotters now held at Gitmo, due to the "behavioral and psychological problems” he’s been afflicted with since the start of the CIA-sanctioned torture he’s endured. According to the Senate report, the detainee "exhibited behavioral and psychological problems, including visions, paranoia, insomnia and attempts at self-harm” in captivity, and “CIA psychologists linked [his] deteriorating mental state to isolation and inability to cope with his long-term detention." According to the Miami Herald, Col. Pohl excused the linguist during Monday’s hearing, effectively postponing proceedings until Wednesday. In the meantime, attorneys for the suspected terrorists may file papers with the court concerning the matter. The appearance of the alleged CIA black site attendee was either “the biggest coincidence ever” or “part of the pattern of the infiltration of defense teams,” Bormann told the court, according to the Herald. Proceedings for the men halted in August after defense attorneys alleged the FBI had attempted to turn a security officer for Al Shibh into an informant. If convicted of terrorism, the defendants face the death penalty.